Wet Shaving and using your cut throat razor? Nothing like HOT lather on these cold winter mornings! $95 only - no postage / pick up only! - no postage / pick up only! handling at the time of order. HG "Q" scuttle and DE "Razor Beaker"
HG "Q" scuttle + DE "Razor Beaker"
The DE Razor Beaker allows the DE razor to be dipped into the beaker, full of hot water and rub on the judder bars on the inside bottom of the beaker to help clean out the whiskers in between the blades. 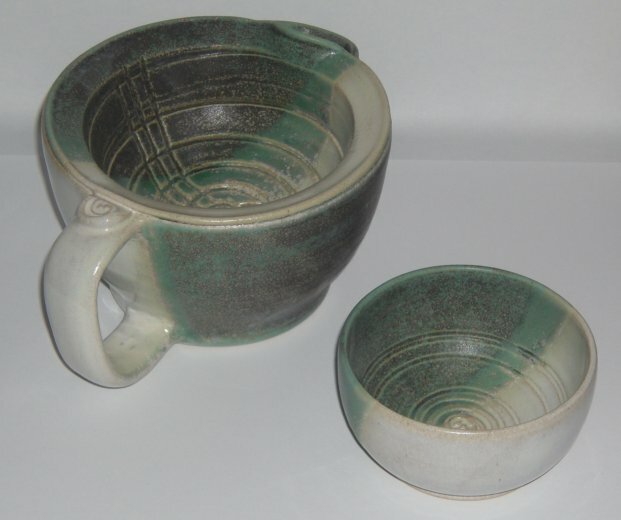 The small cup is used for the soap. 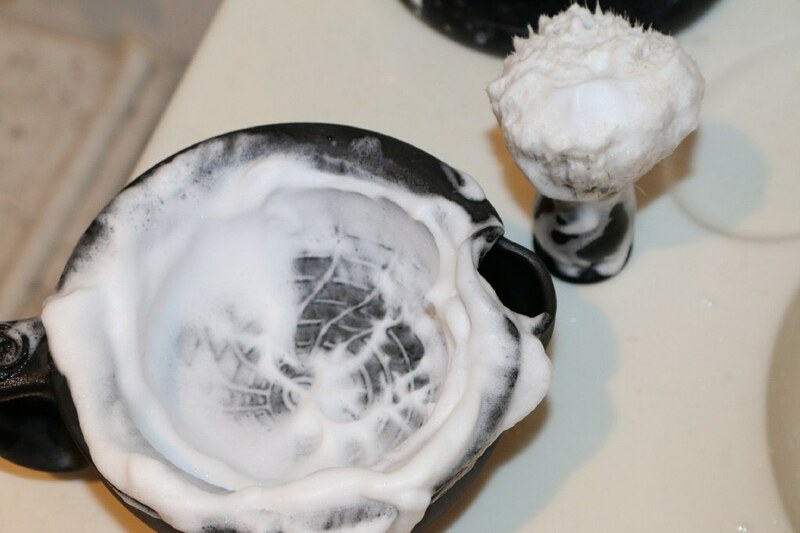 Shavers grate the soap and press it into the cup, others melt the soap and pour it into the cup. 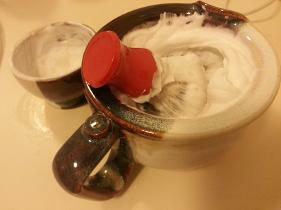 Pre lather pickup onto the brush is done in the cup and lathering is done in the scuttle. upside down into the scuttle, keeping the soap ready, moist and reduces the soap from cracking. With a set of 3, a lid can be requested. Fragrances can be written on the label area with a permanent marker. Keeps the counter top uncluttered. It's something special I use! Again, please accept my deepest apologies for the delay in deliveries. Catching up on the orders! After a few test fires, things should be back to normal. Pottery shed with new slab, floor and walls just needing to be put together. Solid Colours and . . .
Special Colours and . 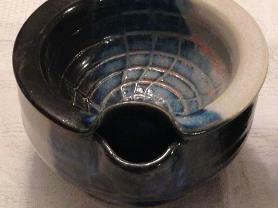 . .
- has a shallow inner bowl, 9.5cm across, with vertical and spiral grooves. 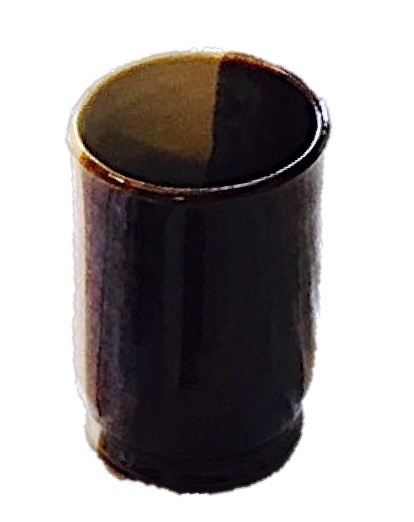 - comfortable handle and easy filling/pouring spout. - Postage within Australia is $18. - Postage Internationally, Asia & Europe is $125. - USA Postage is $120 plus $9 for US Border Security Fee. Colours are at your choice. My other half, Jennifer, got me one of your fantastic scuttles for Christmas and said I should send in a review. With one thing and another (read - memory like a sieve) I hadn't gotten around to writing and sending one off till now. First up I would just like to say I loved the finish on it. The matte black looked amazing and thank you for getting it done as a rush order so I would have it by Christmas. I will admit I hadn't ever heard of a scuttle before. So a quick web search on Christmas morning (including swinging by your website) and I was off to boil the kettle. OH MY GOODNESS... how have I lived without having hot lather to put on my face until now? The size of the soap bowl is just perfect. The brush fits in and can move around nicely without having too much room making you have to chase the soap. 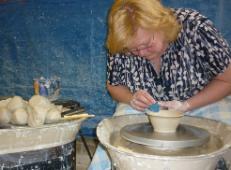 The grooves in the bowl of the scuttle work great for making the soap lather up wonderfully. 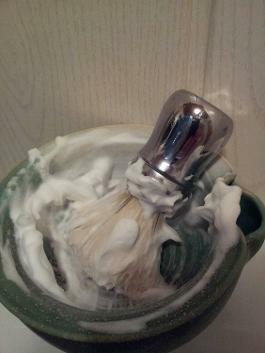 I normally load up my brush lightly and give it a quick swirl to get some suds in the scuttle before loading up properly as I've found it this makes for a lot richer lather with my chosen soap. This may just be something I have found, but once I have completed my shave I use the water that was heating the scuttle to pour out onto my face towel and then clean off the stray bits of lather still on my face. It's generally cooled down enough by then to not scald my face, but is still hot enough to give that nice hot towel feel to it. All in all I'm loving my scuttle. Only once since receiving my scuttle have I shaved without using it. How on earth do people shave with cold lather? Never again if I can avoid it. Hello Helena, we're still packing up. Moving doesn't happen for another 2 weeks. I've used the scuttle quite a bit since I got it. I've got to say I'm super impressed with it. It's far superior to my Georgetown Pottery scuttle. It is shallower in the bowl which I like. It helps to stop the brush constantly knocking on the side of the scuttle. Whilst the ridges in it are less pronounced than the Georgetown, they are thinner in width and have sharper edges which means it creates heaps of lather. 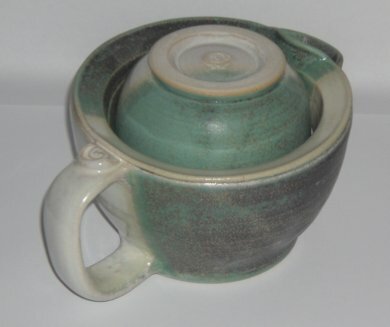 It also holds more hot water than the Georgetown scuttle which means that it keeps the lather warmer for longer. Ergonomically it's about the same as the Georgetown to hold. Both are pretty comfortable but I think that yours sits in my hand a little better. The colour of your scuttle is heaps better. The Georgetown range is pretty plain but yours just "pops". The only thing that I think the Georgetown one has over yours is that it has a great cork which is a little wider and taller which makes it easier to push in and take out. Not a big deal at all but something you might want to look at. I hope that helps you. Once I've finally moved and settled into the new house, I'll post a proper review on both Badger and Blade and Straight Razor Place forums. Sorry for the late reply, it was a hectic weekend! I was planning to have a decent picture by now, but so far I have managed only the attached one, taken with a mobile, it's not really good, but it's authentic "weekly day shaving before going to work"! 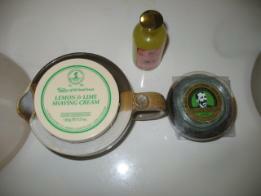 That was with the White Proraso soap, but I have used the Red Proraso and Taylor of Old Bond Street, too. I will send you better ones, if I will be able to slow down a bit. I received the scuttle today. It's great. The Scuttle arrived well packaged and in perfect order. 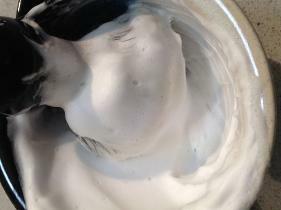 Here is a lather using a Vulfix Badger and Proraso Cream. The bowl lathers well, with heaps of room. 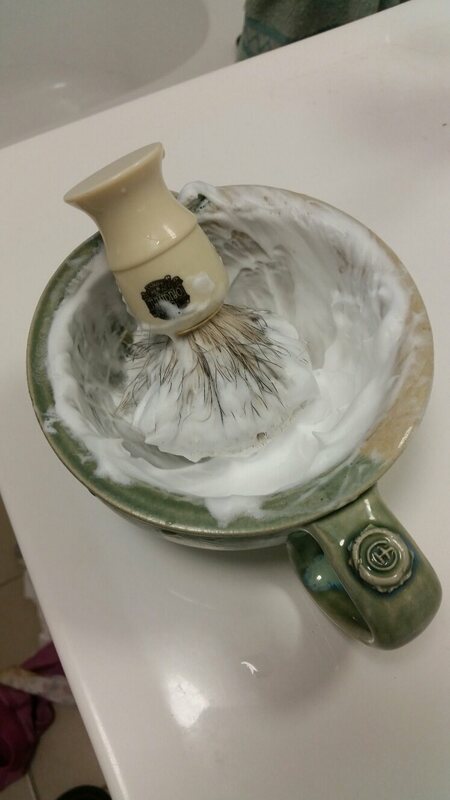 The hot water in the base keeps it beautiful and warm for the whole shave. It looks great in my bathroom with the matching bowl. A great centrepiece. I have let other shavers know about it on various shaving forums with people coming back with some great comments.. It has been a pleasure doing business, keep up the great work, you are a true artisan. I picked up my scuttle today from Australia post and I must say its beautiful. I used it tonight for the first time and its totally bloody awesome! Something I will cherish. 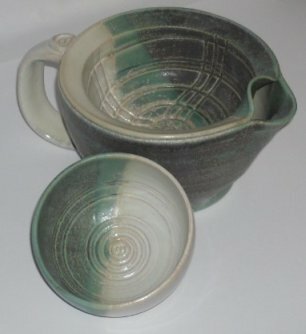 I had a play around taking some photos of a lather I made using your beautiful scuttle you made. I took quite a few shots so will send one with each email I send(around ten emails in total). 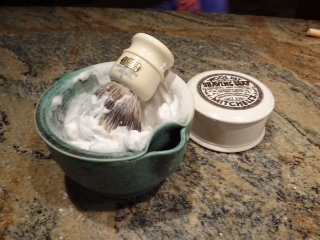 As you will see the brush I'm using is one of the biggest and the most luxurious on the market, a Simpson "Chubby" 3 in super badger hair and i used Mitchell's "wool fat" shaving soap both hand made in England. fashion(single blade razors are better for your skin)sorry i was in such a hurry. p.s. use this as a testimonial if you want to. staples of DE shaving so the point of reference would assist I'd imagine. Yes! I arrived home from work just now to find it had safely arrived. 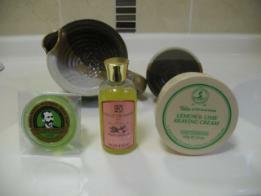 I will froth up a lather tomorrow and send through a review with Photos. It looks fantastic, you are truly an artisan. Just out of curiosity, would this product be microwave safe? Helena -- your scuttle arrived today. Not only is it beautiful, I have used it and it works brilliantly. It's the perfect size and transfers and maintains heat from the hot water way better than my previous scuttle. 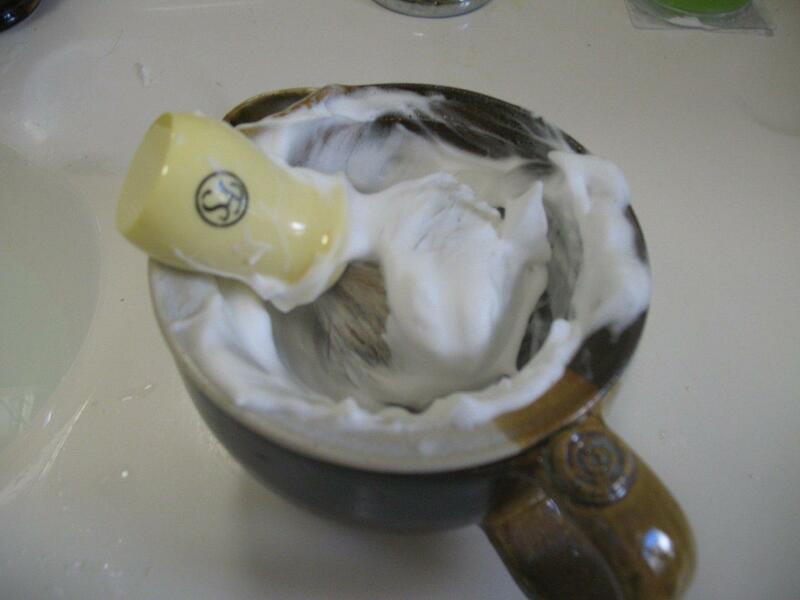 And the cup that holds a round of shaving soap and fits upside down in the scuttle is a touch of genius. I can't thank you enough. It arrived yesterday and looks great, a nice treat during a shocking week at work. Used it this morning, worked a treat. Extremely pleased with it. 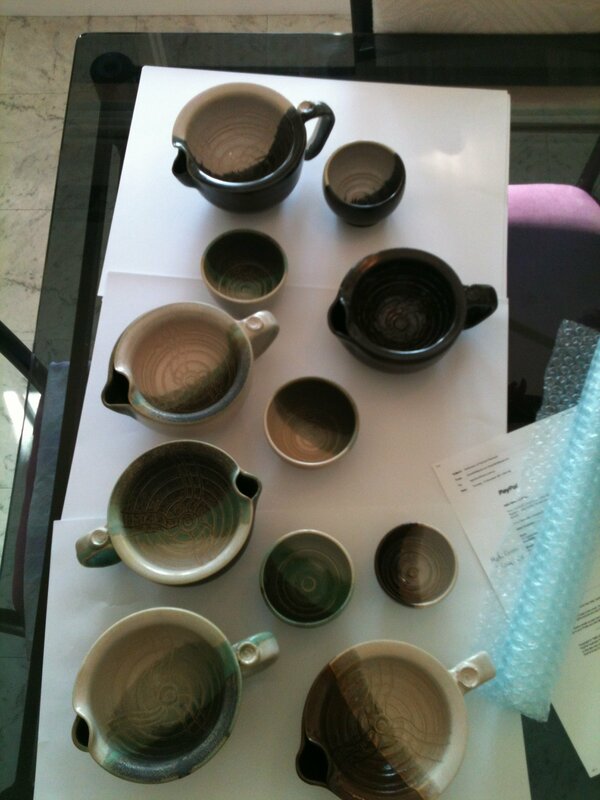 The scuttle arrived safely today, Wed Feb 15th. 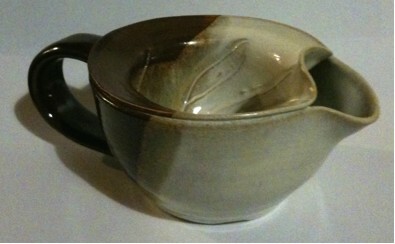 My wife thinks she might use it to make tea, and use the "little cup" for her tea cup. I told her that it was my shaving cup. She is disappointed. Yes, the scuttle arrived on time, without any damage. I've been using it for a week now and am very pleased with it. 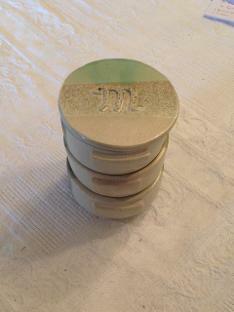 Hi there Helena, the Green and White scuttle arrived safe and sound and works well. Thanks again. I have received the scuttle and it looks so much nicer than I imagined. Thank you once again for a great job. I will tell all my friends. Have a great weekend. The black HG Scuttle arrived yesterday in perfect condition. I had my first shave with it this morning - very nice. Many thanks - it was exactly what I was after. I will be mentioning your name to a couple of people I know who are shaving aficionados. ... I'd like to thank HG Pottery for providing the Australian and international shaving market with a solid, well priced scuttle and wish them best of luck with their business, cheers guys. 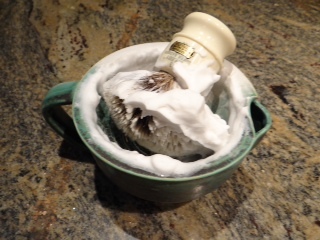 One of the things I had to leave behind was my cherished home-made $20 shaving scuttle. After a few months of shaving in Taiwan I began to sorely miss the luxury of waking up to a warm lather shave. Investigating my options available to me within Taiwan proved fruitless and over the past six months or so I've been floundering around about it not really having much luck with overseas suppliers. 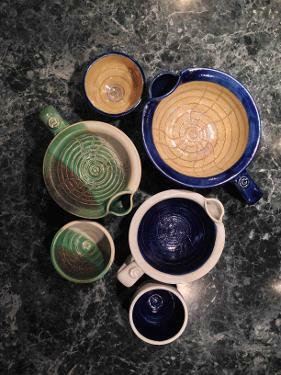 That is until out of the blue one day I was contacted by Helena from HG Pottery. Helena wrote to me asking if I'd be interested in one of her handmade double bowled shaving scuttles. 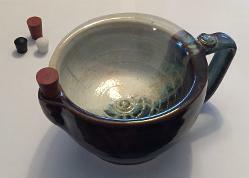 On the verge of just getting my old scuttle sent to me I jumped at the offer of a scuttle being sent my way and eagerly waited for it to arrive in the mail. 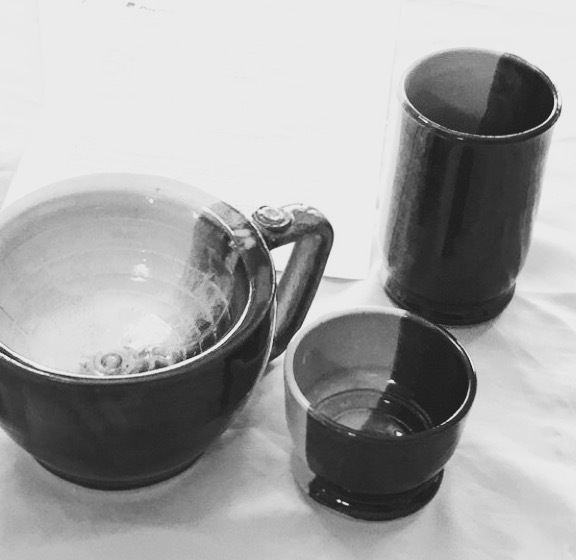 Being hand made by HG Pottery, colour availability is up to you and although I was fine with receiving a two tone brown and white sample - Helena especially whipped up a black one for me which was much appreciated. 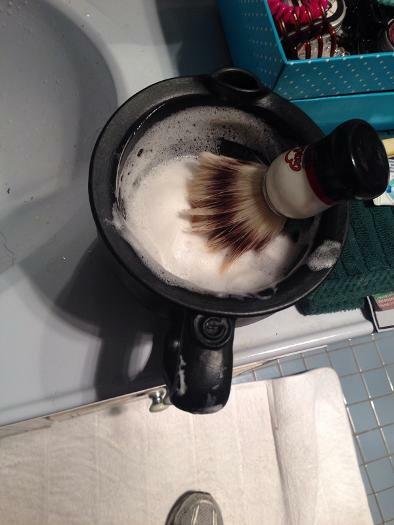 About a week later the package arrived and the next day I had my first warm lather shave in almost a year. Just as good as I'd remembered them back home. The design of the scuttle is slightly different than my basic metal bowl model and you can tell Helena's put a fair bit of thought into the usability of the scuttle she's developed. The HG shaving scuttle feels solidly built and comes in at just under a kg weight wise (well at least according my bathroom scales!). 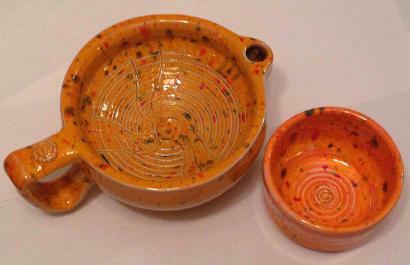 The bowl diameter is roughly 2.5-3 inches. Inside the scuttle bowl you have these wonderful swirly grooves which add to the effectiveness of the lather production. 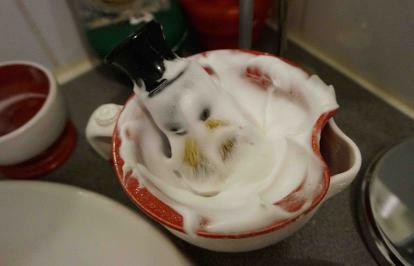 At first I was a bit concerned they might cause undue wear on my shaving brush but after a few uses stopped worrying. The grooves are shallow enough to make a difference when mixing your lather but not deep enough to cause any noticeable stress when rotating the brush inside. 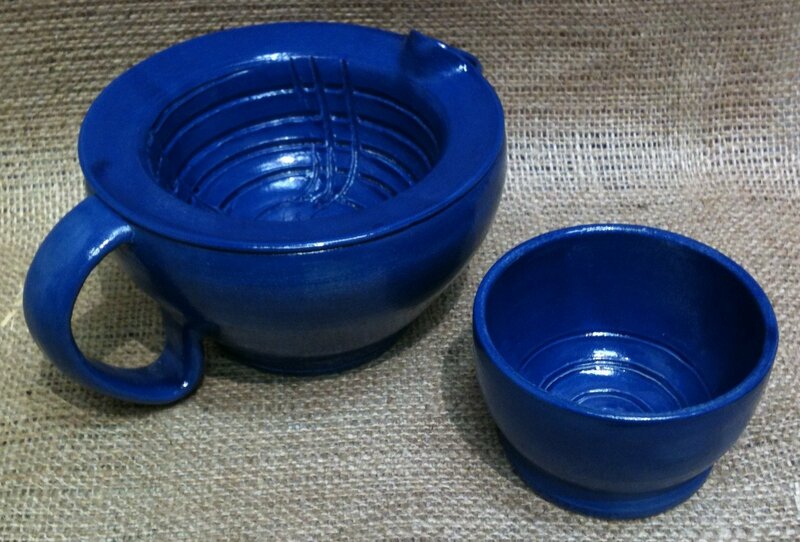 The spout for filling water inside the inner bowl is generously large and quite easy to top up and empty out. No matter what your pouring your boiling water out of there shouldn't be any hassles with water going anywhere, even if your just filling up with hot water out of the tap. Finally HG's scuttle has a big chunky handle for you to hold the scuttle with. Using the handle to hold the scuttle feels quite sturdy and solid even when the scuttle is full. Heat retention is also excellent. On the days I don't have time to boil some water, hot water from the tap does the job and I've got warm lather till the end of my typically 15 minute long shave. 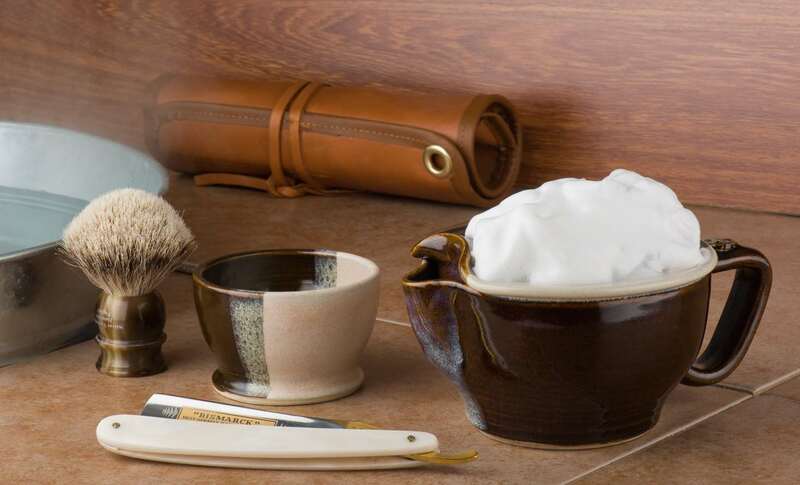 Operating out of Melbourne Australia, HG Pottery has been in business for 9 years now and appear to be the only company producing locally made handcrafted shaving scuttles. On the verge of paying stupid money and importing one from the US or UK I am quite grateful that Helena contacted me when she did. The HG scuttle is a solid product that I'm quite happy to recommend to other shavers. 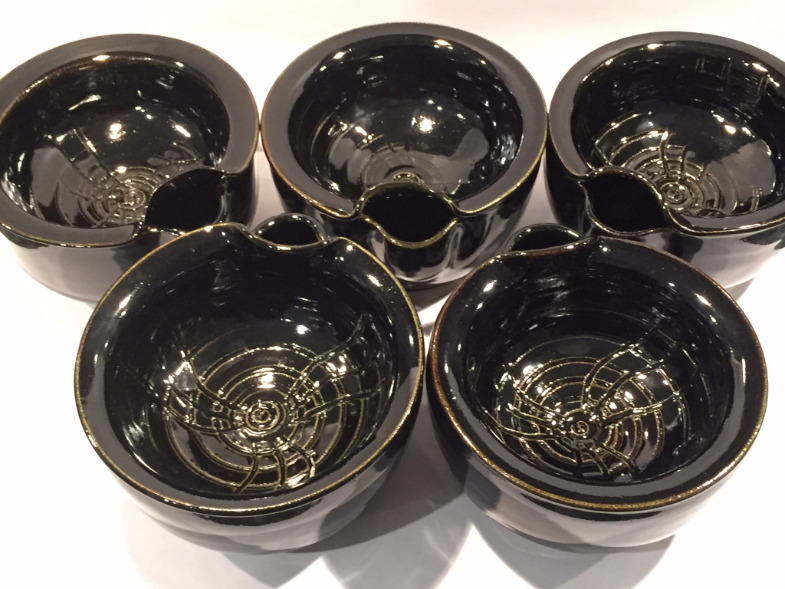 The double walled scuttles are very reasonably priced at $45 AUD + postage (to Taiwan, this worked out to be under $20 AUD). Compared to what you pay for handcrafted scuttles overseas, $45 is quite good value for money and an easy choice. 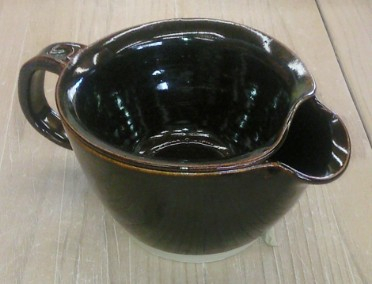 There's also a HG 'brush' scuttle available which is a single bowl scuttle that floats in a sink of hot water. Personally I prefer an out of sink double walled scuttle but for those wanting it, the brush scuttle is about half the weight and price of the double walled scuttle. 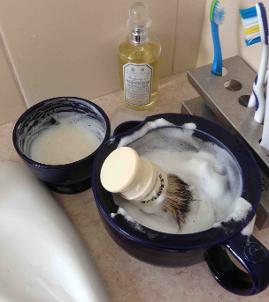 I hope that along with my razor and brush, my new HG shaving scuttle sees me through many years of smooth shaving! I'd like to thank HG Pottery for providing the Australian and international shaving market with a solid, well priced scuttle and wish them best of luck with their business, cheers guys.